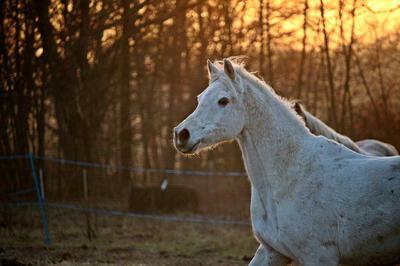 These are some poems that I have written about Warlock, a sweet white Arabian at my stable. The horse of my heart, it shall be you! And my love for you shall never rust. Thank you for being such an awesome friend. Thank you for being there when I needed you most. Thank you for giving me courage when I didn't have it. Thank you for showing me what we really could do. And thank you for showing me to never give up. All the carrots in the world can never repay what you have done for me. Here is a poem about a horse called Dusty who sadly passed away Three years ago. Young and free, you'll be. N' you race across the skies. And with that I'll never part. But I'll never forget you all. A lovely horse you were, true! And I'll say one more good bye. And show jumping we'll do too. Dressage is O.K. for me, but I prefer jumping! Warlock is pretty good at it too. I also will be competing very soon! I'm so happy for you to be competing! I just posted part 13 for Runaway so please read and I'm still working on The Wild Flame and Paruku Island! Please enjoy them all! I will post more poems very soon! Yes I do think my decision is a good one. Really I could never leave my barn, its like a second home to me. Thanks for the idea of making friendship bracelets. I will keep that in mind. Have you ever done dressage? Well, I am doing it right now and I have a show coming up soon. Dressage is okay, do you like it? Cool, I would have made the same decision. If you can afford to pay more and if your trainer agrees then that might be a way forward. One way to earn money is to maybe make friendship bracelets. Just Google how to make them and there are countless ways how to make beautiful bracelets! For them you do need embroidery floss but you could get them really cheap at a cheap store. I also sell mine but I give all profits to charity. So my trainer does teach jumping. But to jump at my barn you have to take two lessons to do it. I don't have that kind of money. So that's why I was thinking about changing. Also my friends ride at the other barn and they kept persisting me to change to there barn. But I was wavering to their barn I think just because they wanted me to come. Not what I thought best for my riding future. And this barn I am right now has Murphy. But I made the decision to stay at the barn I am right now. I probably will talk to my trainer about if it is worth paying more to jump or not. Do you think it is? Thanks so much for your help. You did help me in my decision. But who knows maybe in the future I will change. But you and I know God's in control. So I just need to put it in His hands. Okay, it will be your choice but maybe you can speak to your trainer and maybe he or she will agree to teach you to jump. Jumping is really fun! It is my favourite horse riding activity. Is this the barn that owns Murphy? I know it's hard to leave a horse you love. Maybe you can take lessons at both barns but that would get pretty expensive, wouldn't it? But maybe one time there and the other time at the other barn. I really don't know. If you want, I can post your question on 'Horse questions anyone?' it's a page that is on this website. I'm sure the other girls will give you better answers than I have. I am happy to help if you have any more questions! Well you just made me smile too. And I think you are so awesome. Wow, that is so cool that you jumped 60c. To me that is so high. Aww, why don't they let you ride Warlock? I will pray that they will soon. I haven't really jumped yet but I am hoping to start jumping soon. But I think for me to start jumping I will have to change barns. The barn that has the jumping is really wonderful. But do you think it is worth changing barns for just wanting to jump? I really need feedback on this, it is like really hard to figure out. If I want to leave a nice barn and jump, or not leave. You're so cool! Your comment really put a smile on my face! Just an update: I had a lesson recently, but I couldn't ride Warlock :( But oh well I jumped 60cm on the horse I was riding! My highest yet! P.S. Yeah, I think it's awesome that we both ride English! Don't worry about the late response. And I can't wait for that prayer, oh it's going to be so awesome I just know it. You're welcome about reading and loving your story. It is so good. Also I love how we both ride English, so cool. Awesome! I'll get to work with the prayer right away. By the way, I ride English and thanks for reading my story Runaway. Thanks so much for writing that beautiful poem for me about Murphy. I can't wait to share it to him, he will love it. It is so very true and it just made me love Murphy all over again. This is a little poem I wrote about Murphy! Because Murphy is your name! Not much of a poem, but anyhow, that's what I wrote! I ride English and I think it is awesome. I have't really ridden western a lot, so I can't say much about that. What do you ride? I would love for you to write a prayer for me, I just can't wait. I know it will be awesome. I know! I had a lesson recently and I rode a different horse but he was such a fun ride! If you want I can write another prayer, specially for you! Cool! I'll start writing the poem very soon! That is wonderful that you get to ride every fortnight. I hope you ride Warlock soon, it is hard when you don't get to ride the horse you love. That Show-Jumpers prayer is very wonderful and when I ever start Show-Jumping I will pray that prayer. I think it is awesome that you wrote that prayer. Please write more. Well all your poems are wonderful. I would be happy if you wrote a poem about my favorite horse. That will be so wonderful. Thanks! I ride once a fortnight and I haven't been able to ride Warlock for a few months. :( But I still love him! Warlock is a stubborn horse and he's not the fastest either but I LOVE his canter! Here is another poem, only it's a prayer. But together we're a team Lord. And help me to keep in perfect harmony with my horse. And with you help Lord we will achieve all this. We will compete in our next show. Well actually, it's not that much of a poem but still I like it being a prayer! Did you want me to write a poem about you favourite horses? If so, please tell me! Yes, Hoofbeats. I ride once a week at this amazing barn. Also my favorite horse there, well it is hard to say, but the one I ride the most is this Haflinger named Murphy. He is so stubborn and does not like to stand still. But he has a beautiful canter--it feels like a rocking chair. Then there is this Thoroughbred named Mimosa (Mimi) and she is wonderful too. So you ride Warlock? How many times do you ride a week? Thanks CC! Do you ride? If you do, do you have a fave horse? please tell me! Wow, I like it, soul rider, that sounds beautiful. If you know Bethany Hamilton, you know that she's a Soul Surfer, well in one of her YouTube clips she talks about what a Soul Surfer is. And if you have a passion, like horse riding, you will find out that this doesn't only need to be about horse riding. I call myself a Soul Rider. Why? Well, that's easy. I rider for the joy it brings me and to be with the horse I love. It's my passion, the sport I love doing, and I think that there is a special horse behind them who brings the best out of them and makes them a Soul Rider. Thank you Warlock for making me a Soul Rider! Thank you so much CC! I will post more poems very soon! You are right, horses are angels. God had a plan and said horses will be angels. That was such a beautiful poem. I'm telling you, God gave me and angel. That horse my heart it won! And call him my own special one. God put angels on this earth, I'm telling you and I'm proud to call that angel WARLOCK. Thank you so much everyone! I will post more soon! Made me cry, thanks! They are incredibly moving and have good flow and rhythm. These poems you have written about horses that you love, just are so wonderful and beautiful. I hope someday I may have the day when I can love and be loved by a horse. Thank you for sharing your poems!!! Please write more!!! I love these poems girl! I'm so sorry about Dusty. He reminds me of Tango. Warlock sounds so sweet and he reminds me so much of Peppy. I love them! They have good rhythm and rhyme!